You are here: Home What is the alternative? Nothing short of a political coup is being attempted through the ConDem government’s ‘Big Society’ and Gloucestershire County Council’s (GCC) ‘Big Offer’, as they attempt to bring in staggering cuts and privatisation, and replace many public service staff with volunteers. But they have not been given a mandate to destroy our welfare state and take us back to the poverty of the 1930’s. If carried through well over a million public sector jobs will go, alongside pay cuts, but the private sector will also be devastated as another recession is provoked, causing bankruptcies and more job losses, the Financial Times called it the ‘biggest fiscal blunder since the 1930’s’. Students have shown the way; with waves of protests over £9,000 tuition fees, 80% university teaching budget cuts and the scrapping of EMA (Education Maintenance Allowance), disadvantaging those from poorer backgrounds in post 16 education. In November 50,000 marched in London and nationally 130,000 school, college and university students took part in protests and occupations and tens of thousands more protested as parliament voted on fees. Rednock school students demonstrated and Stroud students occupied MP Neil Carmichael’s offices twice in a week. NHS plans will end our national health service by 2013. NHS Gloucestershire is transferring the Primary Care Trust (PCT) to a Social Enterprise, after a derisory consultation process, a move that will be used to open the way for further privatisation. The government plans are for all NHS hospitals to have to move to foundation status, functioning as independent ‘non profit’ companies or social enterprises. Other NHS reform is to place 80% of the entire NHS budget in the hands of ‘GP Consortia’ who will operate as private companies commissioning services. But our GP’s are not financial managers. Unless these moves are resisted it will mark the end of the NHS as a national healthcare provider and instead will be an official facilitator for private sector healthcare. Library services are to be decimated with 43% cuts, yet staff risk disciplinary action if they speak to the public. Around the county 11 libraries are facing the axe, including Minchinhampton. Many like Nailsworth, Stonehouse and Wotton under Edge are condemned to be minimal self service facilities, while severely reduced opening hours and levels of stock threaten others like Tetbury. The jobs of the 176 county staff are at risk, as council leader Mark Hawthorne has said he could envisage library services run almost entirely by volunteers. Highly skilled staff and a coordinated service cannot be replaced by voluntary groups; this is effectively a move towards privatisation. Painswick library has remained closed because insufficient volunteers can be found. Youth Services around the county are facing meltdown, if the planned 1/3 cut to the youth services budget goes through. Of the 32 council funded youth services, only 5 district hubs, with restricted access, will remain: in Whadden (Cheltenham), Coney Hill (Gloucester), Cirencester, Tewksbury and Coleford, nothing in the Stroud area. The 114 full time equivalent youth worker roles will be under threat. Cuts to the fire service of £3.6 million in Gloucestershire could mean 90 redundancies, including uniformed and non uniformed staff. Lives will be at risk if plans to remove a specialist rescue appliance from Stroud go through, dealing with road accidents, trench and building collapse and heavy lifting equipment, the only one permanently staffed in the county.The government want to slash local council funding by 28% over 4 years. As Mark Hawthorne has said, ‘the government’s top priority is cutting the deficit and Gloucestershire must play its part.’ Stroud District Council is facing a 27% cut in funding. It’s the young, elderly, disabled, poor and vulnerable who will suffer the most. Instead of accepting the cuts, councillors could join the campaign and demand more funds from central government. We should not be made to pay for the bail out of the banks; the previous government could have regulated the City and taken the banking, insurance and mortgage industry into democratic public ownership for the benefit of all. Instead the banks and finance sector have returned to huge profits and been allowed to again receive massive bonuses, while we suffer. The deficit is being used as an excuse to sell off the welfare state, the NHS, education, the public sector and even precious public resources like the Forest of Dean. UK debt has been much higher in the past and is lower now than in Germany, France & Japan. The deficit is £150 billion yet the super rich owe £130 billion in unpaid taxes. The chief executives of the top 100 companies gave themselves a 55% increase in a year. The government spends £2.8 billion a year on private consultants. £3 billon could be raised by taxing big financial transaction. 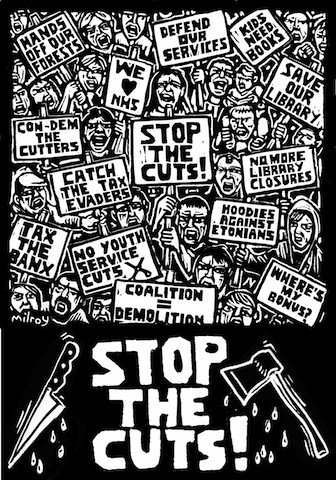 The Cuts can be stopped. Campaigns fighting to defend services, like libraries and youth centres, are stronger if they support others affected by the cuts. Local campaigns, student groups, trades unions, anti cuts groups and others can build a mass national campaign, alongside coordinated public sector industrial action, forcing a change in government and council policy. Say no to any cuts; make those who created the crisis pay for it.